This scripture was the motivation for my sculpture “Kafata II”. The name came from an article I read in the Ensign some years ago by Hugh Nibley. He told of a custom among Arabs, called “Kafata”, where an accused and pursued sinner could flee to the tent of a great sheik. If the sheik put his robe over the shoulder of the supplicant, it meant he was under the sheik’s protection. Brother Nibley likened this to Nephi’s exhortation in 2 Nephi. 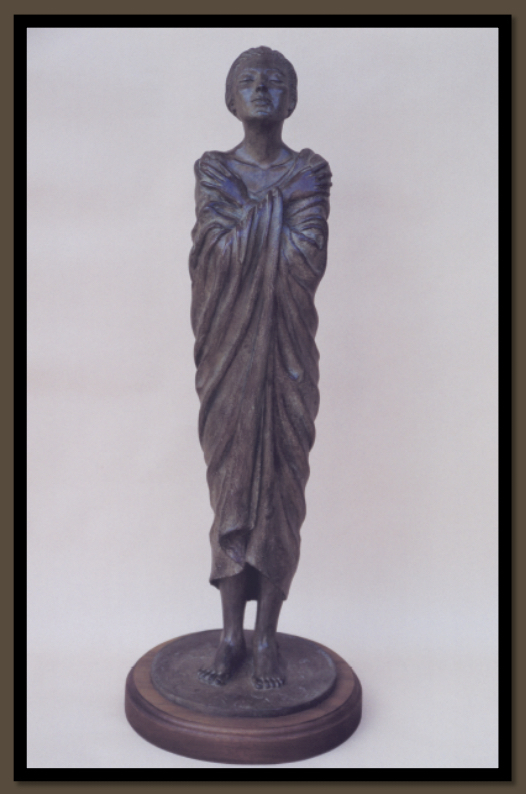 With this sculpture I tried to convey the supreme comfort and joy that we feel as a result of Christ’s atonement for our sins, when we have accepted His gift, and been “encircled about in the robes” of His righteousness.